The Kaweah runs in the spring and sometimes early summer depending on the winter snowpack. Since there are no dams above the whitewater section of this river, the melt from the Southern Sierra determines what flows will be like from year to year. There are years when below normal precipitation leads to flows that are too low for rafting. 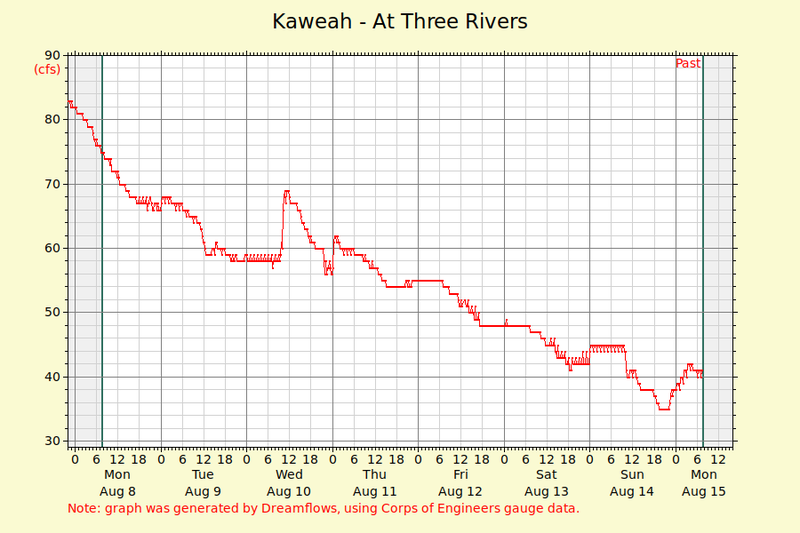 Typically, the Kaweah has navigable flows through June. In years with above average snowfall, the Kaweah can run into early July…that’s when you catch giddy boaters doing a jig and locals living along the river batting down the hatches to keep the whoops and hollers on the river from infiltrating their generally tranquil abodes. Prime flows for rafts are between 1500 – 3000 cfs, kayaks can manuver 500 – 2500 cfs, while Inflatable Kayaks should seek out a minimum of 500 cfs. 1000 – 3000 CFS = Medium flows. Great for aggressive first timers and experienced rafters. Plenty of Class III & IV whitewater. 3000 – 5000 CFS = Medium-high flows. Challenging Class IV whitewater, exciting for experienced rafters. Big waves and swift moving water. Wetsuits required. Above 5000 CFS = Extreme high flows. Fast moving water, with powerful waves and long rapids. Experience is highly recommended. The Kaweah is dependent on snowmelt, so if you’re wondering what the Kaweah season is going to be like in May and June, you can look at the snowpack reports, and then just watch the weather and when it gets hot, there will usually be more water. 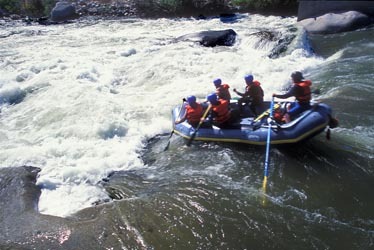 Be prepared for some downright fun rapids surrounded by some scenic areas bursting with dense foliage and giant sequoias. Watch out for some tricky hydraulics and many long boulder slaloms. The class IV Ledges (also called the Slickies) is a playground for kayaks, but rafters can find maneuvering this area a bit hairy. Overall, this area is unusual to see for those on a commercial rafting trip because large expanses of granite bedrock have been formed into smooth shallow slides which are formations not typically seen on most rivers.